The gardener is making a bonfire out of the autumn leaves that have fallen onto his garden during fall. The burning leaves are making a lot of smoke, which is drifting across into a neighbour’s garden where it is making the clothes that are drying on the washing line dirty. The neighbour is putting the fire out by pouring water onto it. (Pouring water onto the fire may actually be making the leaves damp and thus more smokey, which in turn creates a possible further point to the cartoon, even though it’s an inadvertent one). 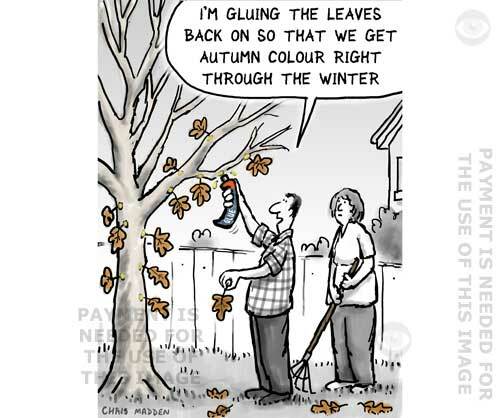 A cartoon about the gardener’s year, the fall equinox, the vernal equinox, seasons in the garden, when to plant bulbs. Cartoon showing a man about to relax in his garden. A cautionary cartoon about the dangers of working too hard towards a goal without taking the time to appreciate things around you while you’re doing it. In other words – don’t focus on your work to the exclusion of everything else – take time to smell the roses. A cartoon about the passing of time, life-work balance, fall gardening, summer gardening, relaxing in the garden. A comic illustration showing a gardener using a power leave blower to blow the autumn leaves off a tree – making them land in the next door neighbor’s garden. A gardener has tidied up the fallen leaves into a wheelbarrow – only for a gust of wind to blow them away again. A study in futility.